Q. Under chin 6 weeks post facelift. Can anything be done to correct this? 6 weeks post face lift with fat injections. Had a lot of swelling and still do have some. Pleased with results with the exception of under chin. Doc says it’s my submandibular glands and sounds like it’s just my unfortunate results. Can anything been done to correct this? Will time help to improve? A. Thank you for sharing your photo. I see 2 issues which may be of concern. 1. 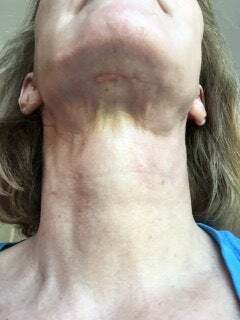 The skin cords from the jawline toward the thyroid and 2. The 2 bulges under the lateral aspects of your jaw. It is far too early to expect your final results. In fact, the collagen / scar production will remodel, settle and smooth out the more vivid concerns you have over the next 6 to 12 months following surgery. In the meantime, careful massage will assist your results as instructed by our surgeon and / or physical therapist. Just like all the features you facelifted due to their sagging, the submandibular glands lose their adherence in their little nook under the jaw and become more prominent. There are very few surgeons who will offer submandibular gland removal due to its side-effects and complications. Proper serial dosing of the glands with Botox to reduce their activity (being mindful of the potential side-effects including dry mouth, salivary gland stones, increased risk of dental cavities, reduced ability to properly digest food and others). You sound pleased with your surgeon. Raise these concerns and ask for his direction or when fully healed and no further active care is required seek the opinion of another knowledgeable Board Certified Plastic Surgeon or ENT.